From the author of Mr. Eternity, a darkly comic road novel about a millennial couple facing the ultimate question: how to live and love in an age of catastrophe. Young Miami couple Murphy and Eva have almost decided to have a baby when Yahweh, the Old Testament God, appears to Eva and makes an unwelcome demand: He wants her to be his prophet. He also wants her to manage his social media presence. Yahweh sends the two on a wild road trip across the country, making incomprehensible demands and mandating arcane rituals as they go. He gives them a hundred million dollars, but he asks them to use it to build a temple on top of a landfill. He forces them to endure a period of Biblical wandering in the deserts of the southwest. Along the way they are continually mistaken for another couple, a pair of North Carolina society people, and find themselves attending increasingly bizarre events in their names. At odds with their mission but helpless to disobey, Murphy and Eva search their surroundings for signs of a future they can have faith in. Through wry observations about the biggest things--cosmology and theology--and the smallest things--the joys and irritations of daily life--Thier questions the mysterious forces that shape our fates, and wonders how much free will we really have. 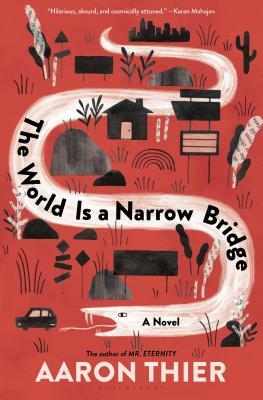 Equal parts hilarious and poignant, The World Is a Narrow Bridge asks: What kind of hope can we pass on to the next generation in a frightening but beautiful world? Aaron Thier is the author of the novels Mr. Eternity, a finalist for the Thurber Prize for American Humor, and The Ghost Apple, a semifinalist for the Thurber Prize. A contributor to the Nation and a graduate of Yale University and the MFA program at the University of Florida, Thier received a 2016 NEA Fellowship in Creative Writing. He lives in Great Barrington, Massachusetts.